Ganghwa Island (江華島), known as the first line of defense for the capital city of Seoul and the royal palaces of the Joseon Dynasty, played a key role in the opening of Korea to the world. When Japan, Russia, France, and the United States knocked at the Hermit Kingdom's front door, the cannons of the fortress at Ganghwa Island greeted them. The royal court's hope was that intruders would see Korea as an unattractive catch, not worth the trouble of an armed conflict. Ganghwa Island, the fifth largest island in South Korea, sits in the estuary of the Han River on the west coast of South Korea, separated from Gimpo on the mainland by a narrow channel spanned by several bridges. The main channel of the Han River separates the island from Gaeseong in North Korea. In the nineteenth century, as outside powers sought to enter Korea by sea, Ganghwa became a point of contact rather than a refuge. In the early ninteenth century, Christianity (Catholicism) took root in Korea opposed by the Daewongun and conservatives in the Korean court. In 1866, distressed by the rapidly growing numbers of Korean converts to Catholicism, as well as the humiliation suffered by China at the hands of Westerners during the Opium Wars, the Korean court persecuted the French missionaries, massacring French Catholic missionaries and Korean converts alike. That same year France launched a punitive expedition against Korea, occupying portions of Ganghwa Island in the fall of 1866. 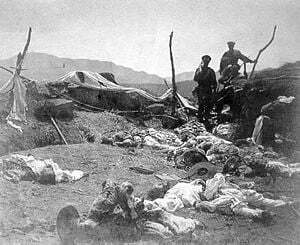 In the first battle, the Korean infantry division suffered heavy losses heavily. General Yang Haun-Soo concluded that only a large cavalry division could stand up to French firepower. The French suffered casualties in an ambush by Korean forces on a French party attempting to occupy the Cheondeung Temple 傳燈寺 strategically located on the island‘s south coast. Aware from the beginning of the expedition that they lacked the forces to defeat Korea, the French fleet bombarded Seoul, recovering the two surviving French priests before steaming to Japan. In Korea, the incident received the name byeong-in yang-yo, or foreign disturbance of the byeong-in year (1866). 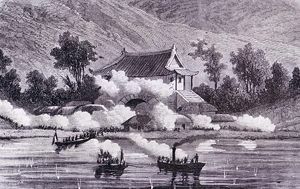 The U.S. Asiatic Squadron occupied the island in May 1871 in retaliation for the massacre of sailors aboard the stranded merchant marine schooner USS General Sherman in Pyongyang in 1866. The squadron hoped to use the opportunity to establish trade and diplomatic relations with Korea. Koreans justified the slaughter of the sailors aboard the General Sherman with the accusation that American sailors had killed Korean inhabitants, plundered the coastal area, and kidnapped a military officer. No evidence confirming those charges has been found. The Korean account relates that angered Korean locals burned the stranded General Sherman after killing the sailors. General Rodgers, commander of the U.S. Asiatic Squadron, sought a direct route by water to the Korean capital Hanyang (present-day Seoul). Encountering Ganghwa Island, he made contact with Korean locals. Misunderstanding between the both sides brought them into conflict. Rodgers made clear that the U.S. fleet would investigate the area without hostile intentions. The Korean fortress opened fire on the fleet as they passed. Rodgers requested a meeting to negotiate, which the Korean commander rejected. The Korean fortress commander is rumored to have replied: “We have been living 4,000 years without any treaty with you, and we can't see why we shouldn't continue to live as we do.” He opened fire on the fleet. The Korean cannons, improperly aligned, missed the ships. The American fleet bombarded the fortresses, taking the position, with marines storming the stronghold. The Imperial Japanese Navy, in Pusan, on its way to Ganghwa Island (江華島), Korea, January 16, 1876. In 1875 a Japanese ship, Unyo, while exploring the coast line on a charting expedition, received fire from the fortress on the Ganghwa Island. When the Unyo launched a crew boat to the island, the garrison fired on them (Ganghwa Island incident). Japan demanded a treaty with Korea following the incident. Early in the following year, Japan sent a large force of the Imperial Japanese Navy to force the negotiation of a treat, the Treaty of Ganghwa resulting. That agreement, concluded on Ganghwa Island, officially opened Korea to Japanese trade. Trade had also taken place between the two peoples in earlier centuries long before Korea became a Hermit Kingdom. ↑  Foundation Myth. Retrieved August 24, 2007. ↑ Ki-baek Lee, A New History of Korea, rev. ed. (Seoul: Ilchogak, 1976. ISBN 8933702040), 96. Ganghwa-do: Korea's most historic island, with several sacred mountains. This page was last modified on 23 May 2017, at 14:54.